If someone asked me to choose just one passage of Scripture from the many favorites that I have, to reflect the main spiritual passion in my heart, it would be… 2 Corinthians 5:11-20. In case you may be wondering why, I will tell you: Before God opened up my understanding to the ‘good news‘ of the gospel, I tried for many years to earn His acceptance by religious practices and trying to be ‘good enough,’ and I was also filled with an overwhelming and paralyzing fear of death, because of what I was taught growing up as a Catholic. (More on that when I share my testimony). However, one day when I began to read the Bible, the truth of God’s Word caused me to question many of the things I had learned in my Catholic doctrine classes, because many of these teachings did not agree with what God’s Word was now saying to me. 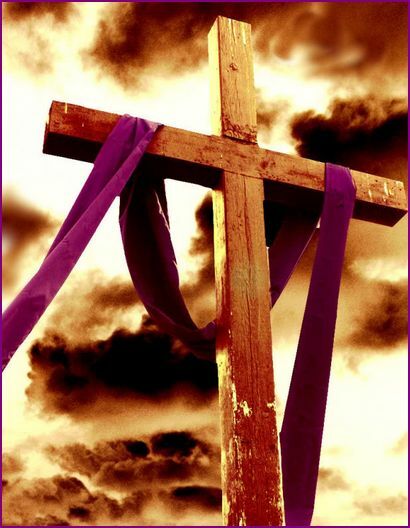 As I started to read, I began to see the depth of His love and mercy that He has towards sinners like me, and God helped me come to understand that Jesus paid my debt to sin in full, because He died in my place (and yours) on the cross! (I will go into great detail when I share my testimony in the near future). Why was it that we, as Catholics, were never told these amazing truths? The realization of the depth of the love that God has for me (and you) and the extent He went to, so that (you and) I could become His child and be set free from the control that sin has on me (and all of us), filled me with His amazing peace and joy, and gave me the assurance that I would be in heaven whenever my life would end. I was filled with an urgency to share the joyous truth that God had revealed to me in His Word with everyone! 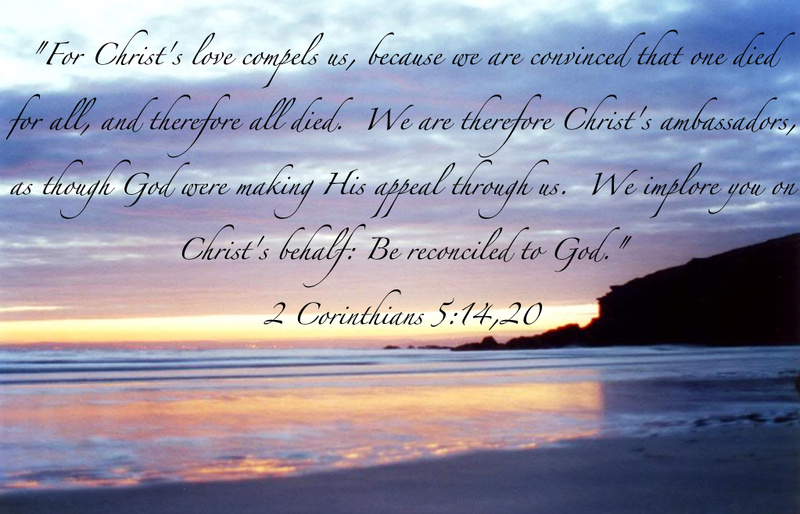 And as it says in 2 Corinthians 5, ‘Christ’s love did compel me’ to reach out to whomever God would bring my way, so they could also hear that they could be reconciled to God, by placing their trust in what Jesus had already done for them, and not in anything they could ever do. As God’s Word says, “Make the most of every opportunity,” (Ephesians 5:16, Colossians 4:5) and that I did… The first thing that I was strongly led to do, (which I also mentioned in at least one other introduction) was to put a tract called, ‘How A Roman Catholic Can Be Sure Of Heaven’ on every windshield of every car in the parking lot of the Catholic church I used to attend, during the time people were at ‘Mass,’ and finished just as they began to come out of church. Every stranger who came to my home, every person who helped me when my 1978 Chevy Monza would die out, (and trust me, that happened many times) every opportunity God gave me, I gave each person a tract or Bible, and when there was enough time, I shared my testimony with them, as well. When any Jehovah’s Witness or Mormon would come to my door, I saw them as devoted and deceived as I had been, and God filled me with compassion and a deep desire to share His truth with them that He had revealed to me. God bless you, and thank you very much for stopping by and taking time out of your busy day to read my poems. Not too long ago, a friend had shared with me about two Jehovah’s Witnesses, who now have serious concerns about the teachings of the Watchtower Society. But in spite of the courage they have in making the decision to leave, they are also experiencing fear and confusion. My friend had asked me to pray for them, and later as I thought about what they may possibly be going through as I prayed for them, this poem began to come together in my mind. If God leads you to pray for them, your prayers would be greatly appreciated. I do not, however, feel free to share their names. God knows who they are, and cares deeply for them, and for all of you who have been mentally, emotionally, and sadly sometimes even physically and sexually abused by religious movements such as the Watchtower Society. Any religion that claims they are the only source of truth, or tries to take away your freedom to think and to test what they say in light of Scripture, as God’s Word tells us we are to do, and proclaims doctrines that conflict with or completely contradicts Biblical truth, should be clear warning signs to you that they are presenting a false gospel. Seek God in His Word, and ask Him to reveal His truth to you, and He will be faithful to do that. May God reveal His truth to all of you who may unknowingly be trapped in a false religious system. As He does, I pray God will give you courage so that you would have the strength and determination to leave. May God lead you out and bring healing to your minds and restore your lives, so that you will bring Him glory and help others who are going through the same emotional pain, anger, and confusion that you are experiencing. ***UPDATE FEBRUARY 6th 2011***For those of you who are either considering joining the Watchtower Society, or who are already involved in it and are beginning to have doubts and questions about their teachings, please don’t ignore your concerns and push them to the back of your mind. Instead, please read a King James Version of the Bible, and test all things you hear against the truth of God’s Word. God set forth this practice of testing men’s words against the truth of His Word to protect us from being deceived. Even though you are told as a Jehovah’s Witness not to question the Governing Body’s teachings, because of your love for Jehovah you need to hold His Word higher than the words of men. Even though they claim to speak for God, their words still need to be tested against the truth of God’s Word. Please choose to be the spiritual leader for your family and pray and ask God to show you what the truth is in His Word, to protect you and your loved ones. If you do, you will save yourself and your loved ones from a lot of heartache and serious mental and emotional confusion. God bless you. ***UPDATE FEBRUARY 7th 2011 *** >>>Click here for reachouttrust.org <<<An organization that reaches people with Biblical truth. God bless you, and thank you very much for stopping by to read my poems. 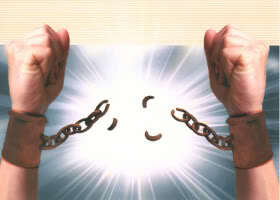 That Jesus took Your wrath upon Himself, and He’s waiting to set them free. Copyright©2010 Mary K. Dalke/Living For His Glory/Living4HisGlory All rights reserved. Thoughts for this poem have been in my mind and on my heart for the past few months. More and more, I am being made aware of just how few preachers are left who present pure Biblical truth. So many have accepted, practice, and have even incorporated mystical pagan practices into their services, and are leading their people like sheep to the slaughter! I have much more to say, and because all of this has been on my mind for so long, this poem became one of my longest poems ever! (UPDATE 4/30/12) At the time I wrote this I found out that for some reason there didn’t seem to be enough room on this page to share the rest of my thoughts or to place a picture, so I wrote a separate page. If you’d like, please click on my page ‘THERE’S A FAMINE IN THE LAND MY THOUGHTS, SCRIPTURES, AND INFORMATION,’ and you can read much more. Between this poem and my ‘WATCHMEN ON OUR KNEES’ poem, I think I have expressed all my thoughts and concerns in poem form about false teachings, etc.,–for now– and I have stated the importance of testing the teachings of all people who claim to be speaking the ‘truths and new revelations of God’ against the truth of God’s Word, in my introductions. 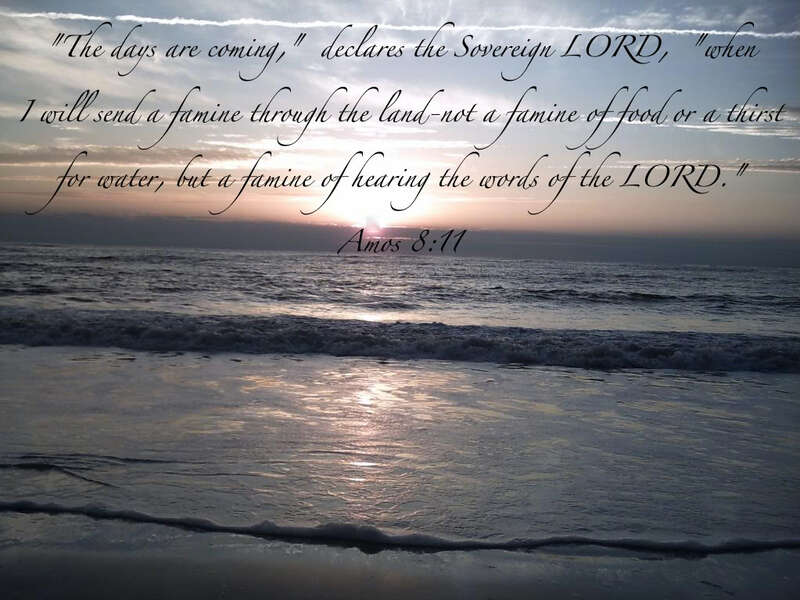 I will however, be updating my ‘THERE’S A FAMINE IN THE LAND…MY THOUGHTS, SCRIPTURES, AND INFORMATION’ page, (when time allows) with new information I will add links to as well as videos that I will post. I will also date them, so you know when the information was added. One day I was investigating ‘INTERNATIONAL HOUSE OF PRAYER,’ because one of my friends had mentioned she was thinking about getting involved with it, and I wanted to send her some videos to warn her about the unbiblical things that are now happening in that movement. In doing so, I unfortunately discovered another ‘revival’ that is taking place in Kansas City, at ‘World Revival Church.’ Please be in prayer for all the spiritual deception taking place within the church today, and please make sure to take the time to test things in light of Scripture so you will not be led into deception. I have more poems I am working on, concerning false teachings in the church, but for now I will now go back to writing poems from a personal perspective, and other ones as well. More poems coming soon. I hope and pray that the warnings throughout Scripture, and somehow my last two poems as well, will make you realize the importance of reading and studying God’s Word more, and that my other poems have in some way brought encouragement and comfort to you. Please stay in God’s Word, finding His wisdom, peace, and comfort for all you may be going through in life, true joy that does not depend upon the circumstances of life, and truth to protect you from deception! Thank you so much for stopping by and taking time out of your busy day to read some of my poems and posts. Lord, how could so many people, have allowed themselves to become deceived? Revealed by Your Holy Spirit that they once received? On the judgment day that’s appointed? And into deception many would go? And it would come from Your very own hand? Is it because many have hungered, for more than Your Words, pure and true? By accepting pagan practices that lead to a god other than You? Copyright©2010 Mary K. Dalke/Living4HisGlory/LivingForHisGlory All rights reserved.